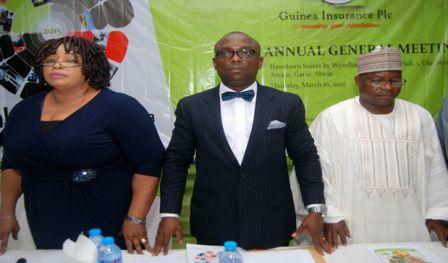 Shareholders of Guinea Insurance PLC on Thursday, July 12, 2018 applauded the Board of Directors for its outstanding performance in the financial year ended 31stDecember 2018 during its 2017/60th Annual General Meeting held recently in Benin City, Edo State. Addressing shareholders at the 60th Annual General Meeting of the Company in Benin City, the Chairman, Board of Directors of Guinea Insurance, Barr. Godson Ugochukwu, reaffirmed the Board’s commitment to grow the company and announced plans aimed at celebrating the 60th Anniversary of the underwriting firm “This year also marks the 60th Anniversary of our Company! Soon enough, you will begin to see signs of the upcoming grand celebrations as you move around major cities in the country… you will agree with me that 60 years is a milestone of epic proportions. There are only a few insurance companies in Nigeria that can boast of such a rich history, wealth of experience and consistent longevity. To this end, the Board and Management are resolved to use the 60th celebrations of our beloved Company to further stamp our footprints even more indelibly in the landscape of the insurance industry in Nigeria”. During the meeting, three Directors namely: Alhaji Hassan Dantata; Mr. Osita Chidoka and Mr. Chukwuemeka Uzoukwu, were unanimously re-elected by shareholders. While speaking on behalf of the Shareholders the: National Chairman, New Dimension Shareholders Association (NDSA), Mr. Patrick Ajudua; National Chairman, Progressive Shareholders Association of Nigeria (PSAN), Boniface Okezie and National Coordinator, Heritage Shareholders Association of Nigeria (HSAN), Wale Adewale were unanimous in their clarion call to the board of Guinea Insurance to continue to keep the faith even in the face of harsh economic realities as the reward for work well done is the opportunity to do even more. On a more inspiring note, the shareholders were of good cheer as they applauded the impressive performance in the underwriter’s profit and opined that it was indicative of the company’ readiness to be re-positioned for profitability. On its financial performance as contained in Annual Report & Accounts presented to shareholders at the company’s 60th Annual General Meeting (AGM), the underwriting firm sustained in Gross Premium Income by 11.7% from N913.4 million in 2016 to N1,020.4 billion in 2017. Net Premium Income also grew by 15% from N649.5 million in 2016 to N747.1 in 2017. Underwriting Profit grew from N453.4 million recorded in 2016 to N501.1 in 2017 representing a growth rate of 11%. Claims Paid by Guinea Insurance on various classes of insurance decreased by 47% from N304.9 million in 2016 to N161.5 million in 2017, due to operational efficiency in terms of people, processes, technology and communications, the underwriter had said. In spite of the economic headwinds that characterized the period under review, the underwriter said its Investment Income recorded a marginal decline of 3% from N215.5 in 2016 to N208.3 in 2017. Howbeit, a remarkable performance was delivered as the underwriter posted a Profit Before Tax increase of 35% from N176.3 million in 2016 to N237.8 million in 2017; better still, it recorded a whopping Profit After Tax increase of 518% from N40.6 million in 2016 to N251.0 million in 2017. The underwriter’s zest to be over and done with the challenge of solvency margin, was further consolidated during the year under review as its Solvency Margin grew by 13% from N3.0 billion in 2016 to N3.4 billion in 2017, while increase in Shareholders’ Fund as recorded in its books stood at 16% from N2.9 billion in 2016 to N3.4 billion in 2017. The Company’s Chairman, Barr. Godson Ugochukwu substantially noted that the company’s philosophy of delivering value to its shareholders without compromising service standard remains sustainable. He said: “we are an upwardly mobile company, peopled with skilled professionals, our strength is made manifest in our passion for high standards and the single-minded determination to emerge a world class enterprise, one with the scope and economies of scale necessary to drive home our unflinching mandate of returning Guinea Insurance on the path of sustainable profitability”. This avowal is evident in the underwriter’s 2017 performance metrics.